American physicist mission specialist astronaut 1980-2005. Shared record of seven spaceflights. Status: Inactive; Active 1980-2005. Born: 1950-04-05. Spaceflights: 7 . Total time in space: 66.76 days. Birth Place: Costa Rican. Educated University of Connecticut; MIT. PERSONAL DATA: Born April 5, 1950, in San José, Costa Rica, to the late Mr. Ramón A. Chang-Morales and Mrs. María Eugenia Díaz De Chang. Married to the former Peggy Marguerite Doncaster of Alexandria, Louisiana. Four children. He enjoys music, glider planes, soccer, scuba diving and hiking. His mother, brothers and sisters still reside in Costa Rica. EDUCATION: Graduated from Colegio De La Salle in San José, Costa Rica, in November 1967 and from Hartford High School in Hartford, Connecticut, in 1969; received a Bachelor of Science degree in mechanical engineering from the University of Connecticut in 1973 and a Doctorate in Applied Plasma Physics from the Massachusetts Institute of Technology (MIT) in 1977. SPECIAL HONORS: Recipient of the University of Connecticuts Outstanding Alumni Award (1980); seven NASA Space Flight Medals (1986, 1989, 1992, 1994, 1996, 1998, 2002); two NASA Distinguished Service Medals (1995, 1997) and three NASA Exceptional Service Medals (1988, 1990, 1993). In 1986, he received the Liberty Medal from President Ronald Reagan at the Statue of Liberty Centennial Celebration in New York City and, in 1987, the Medal of Excellence from the Congressional Hispanic Caucus. He received the Cross of the Venezuelan Air Force from President Jaime Lusinchi during the 68th Anniversary of the Venezuelan Air Force in Caracas, Venezuela (1988), and the Flight Achievement Award from the American Astronautical Society (1989). Recipient of four Doctorates “Honoris Causa” (Doctor of Science from the Universidad Nacional de Costa Rica, Doctor of Science from the University of Connecticut, Doctor of Law from Babson College and Doctor of Science from the Universidade de Santiago de Chile. He is honorary faculty at the College of Engineering, University of Costa Rica. In April 1995, the government of Costa Rica conferred on him the title of “Honorary Citizen.” This is the highest honor Costa Rica confers to a foreign citizen, making him the first such honoree who was actually born there. Recipient of the American Institute of Aeronautics and Astronautics 2001 Wyld Propulsion Award for his 21 years of research on the Variable Specific Impulse Magnetoplasma Rocket (VASIMR) engine. EXPERIENCE: While attending the University of Connecticut, he also worked as a research assistant in the Physics Department and participated in the design and construction of high-energy atomic collision experiments. Following graduation in 1973, he entered graduate school at MIT, becoming heavily involved in the United States controlled fusion program and doing intensive research in the design and operation of fusion reactors. He obtained his Doctorate in the field of Applied Plasma Physics and fusion technology and, in that same year, joined the technical staff of the Charles Stark Draper Laboratory. His work at Draper was geared strongly toward the design and integration of control systems for fusion reactor concepts and experimental devices in both inertial and magnetic confinement fusion. In 1979, he developed a novel concept to guide and target fuel pellets in an inertial fusion reactor chamber. Later on, he was engaged in the design of a new concept in rocket propulsion, based on magnetically confined high temperature plasmas. As a visiting scientist with the MIT Plasma Fusion Center, from October 1983 to December 1993, he led the plasma propulsion program there to develop this technology for future human missions to Mars. 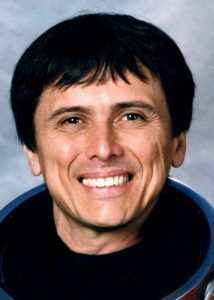 From December 1993 to July 2005, Dr. Chang-Díaz served as Director of the Advanced Space Propulsion Laboratory at the Johnson Space Center, where he continued his research on plasma rockets. He is an Adjunct Professor of Physics at Rice University and the University of Houston and has presented numerous papers at technical conferences and in scientific journals. Dr. Chang-Díaz retired from NASA in July 2005. NASA EXPERIENCE: Selected by NASA in May 1980, Dr. Chang-Díaz became an astronaut in August 1981. While undergoing astronaut training, he was also involved in flight software checkout at the Shuttle Avionics Integration Laboratory (SAIL) and participated in the early space station design studies. In late 1982, he was designated as support crew for the first Spacelab mission and, in November 1983, served as in-orbit Capsule Communicator (CAPCOM) during that flight. From October 1984 to August 1985, he was leader of the astronaut support team at Kennedy Space Center, Florida. His duties included astronaut support during the processing of the various vehicles and payloads as well as flight crew support during the final phases of the launch countdown. He has logged more than 1,800 hours of flight time, including 1,500 hours in jet aircraft. Dr. Chang-Díaz was instrumental in implementing closer ties between the astronaut corps and the scientific community. In January 1987, he started the Astronaut Science Colloquium Program and later helped form the Astronaut Science Support Group, which he directed until January 1989. A veteran of seven spaceflights, STS 61-C (1986), STS-34 (1989), STS-46 (1992), STS-60 (1994), STS-75 (1996), STS-91 (1998) and STS-111 (2002), he has logged more than 1,601 hours in space, including 19 hours and 31 minutes in three spacewalks. SPACEFLIGHT EXPERIENCE: STS 61-C (January 12 to January 18, 1986) was launched from Kennedy Space Center on space shuttle Columbia. STS 61-C was a six-day flight, during which Dr. Chang-Díaz participated in the deployment of the SATCOM KU satellite, conducted experiments in astrophysics and operated the materials processing laboratory MSL-2. Following 96 orbits of the Earth, Columbia and her crew made a successful night landing at Edwards Air Force Base, California. Mission duration was 146 hours, 3 minutes and 51 seconds. On STS-34 (October 18 to October 23, 1989) The crew aboard space shuttle Atlantis successfully deployed the Galileo spacecraft on its journey to explore Jupiter, operated the Shuttle Solar Backscatter Ultraviolet Instrument (SSBUV) to map atmospheric ozone and performed numerous secondary experiments involving radiation measurements, polymer morphology, lightning research, microgravity effects on plants and a student experiment on ice crystal growth in space. STS-34 launched from Kennedy Space Center and landed at Edwards Air Force Base. Mission duration was 119 hours and 41 minutes and was accomplished in 79 orbits of the Earth. STS-46 (July 31 to August 8, 1992) was an eight-day mission, during which crew members deployed the European Retrievable Carrier (EURECA) satellite and conducted the first Tethered Satellite System (TSS) test flight. Mission duration was 191 hours, 16 minutes and 7 seconds. Space shuttle Atlantis and her crew launched and landed at the Kennedy Space Center after completing 126 orbits of the Earth in 3.35 million miles. STS-60 (February 3 to February 11, 1994) was the first flight of the Wake Shield Facility (WSF-1), the second flight of the Space Habitation Module-2 (Spacehab-2) and the first joint U.S./Russian space shuttle mission on which a Russian cosmonaut was a crew member. During the eight-day flight, the crew aboard space shuttle Discovery conducted a wide variety of biological materials science, Earth observation and life science experiments. STS-60 launched and landed at Kennedy Space Center. The mission achieved 130 orbits of Earth in 3,439,705 miles. STS-75 (February 22 to March 9, 1996) was a 15-day mission with principal payloads being the reflight of the Tethered Satellite System (TSS) and the third flight of the United States Microgravity Payload (USMP-3). The TSS successfully demonstrated the ability of tethers to produce electricity. The TSS experiment produced a wealth of new information on the electrodynamics of tethers and plasma physics before the tether broke at 19.7 km, just shy of the 20.7 km goal. The crew also worked around the clock performing combustion experiments and research related to USMP-3 microgravity investigations used to improve the production of medicines, metal alloys and semiconductors. The mission was completed in 252 orbits, covering 6.5 million miles in 377 hours and 40 minutes. STS-91 Discovery (June 2 to June 12, 1998) was the ninth and final shuttle-Mir docking mission and marked the conclusion of the highly successful joint U.S./Russian Phase I program. The crew, including a Russian cosmonaut, performed logistics and hardware resupply of the Mir during four docked days. They also conducted the Alpha Magnetic Spectrometer experiment, which involved the first-of-its-kind research of antimatter in space. Mission duration was 235 hours and 54 minutes. STS-111 Endeavour (June 5 to June 19, 2002) delivered a new International Space Station resident crew and a Canadian-built mobile base for the orbiting outposts robotic arm. The crew also performed late-notice repair of the stations robotic arm by replacing one of the arms joints. It was the second space shuttle mission dedicated to delivering research equipment to the space platform. Dr. Chang- Díaz performed three spacewalks to help install the Canadian Mobile Base System to the stations robotic arm. STS-111 also brought home the Expedition 4 crew from their six-and-a-half-month stay aboard the station. Mission duration was 13 days, 20 hours and 35 minutes. Unacceptable weather conditions in Florida necessitated a landing at Edwards Air Force Base, California. This is the only version available from NASA. Updates must be sought directly from the above named individual. Born April 5, 1950, in San Jos�, Costa Rica, to the late Mr. Ram�n A. Chang-Morales and Mrs. Mar�a Eugenia D�az De Chang. Married to the former Peggy Marguerite Doncaster of Alexandria, Louisiana. Four children. He enjoys music, glider planes, soccer, scuba-diving, hunting, and hiking. His mother resides in Costa Rica. Graduated from Colegio De La Salle in San Jos�, Costa Rica, in November 1967, and from Hartford High School in Hartford, Connecticut, in 1969; received a bachelor of science degree in mechanical engineering from the University of Connecticut in 1973 and a doctorate in applied plasma physics from the Massachusetts Institute of Technology (MIT) in 1977. Recipient of the University of Connecticut's Outstanding Alumni Award (1980); NASA Space Flight Medal (1986); the Liberty Medal from President Ronald Reagan at the Statue of Liberty Centennial Celebration in New York City (1986); the Medal of Excellence from the Congressional Hispanic Caucus (1987); NASA Exceptional Service Medals (1988, 1990, 1993); American Astronautical Society Flight Achievement Award (1989); NASA Space Flight Medals (1986, 1989, 1992, 1994). Outstanding Technical Contribution Award, Hispanic Engineer National Achievement Awards Conference (1993). Awarded the Cross of the Venezuelan Air Force by President Jaime Lusinchi during the 68th Anniversary of the Venezuelan Air Force in Caracas, Venezuela (1988). Recipient of three Honoris Causa Doctorates: Doctor of Science from the Universidad Nacional de Costa Rica; Doctor of Science from the University of Connecticut and Doctor of Law from Babson College. Also Honorary faculty from the College of Engineering of the University of Costa Rica. Honorary Citizenship from the government of Costa Rica (April 1995). This is the highest honor Costa Rica confers to a foreign citizen, making him the first such honoree who was actually born there. While attending the University of Connecticut, he also worked as a research assistant in the Physics Department and participated in the design and construction of high energy atomic collision experiments. Following graduation in 1973, he entered graduate school at MIT, becoming heavily involved in the United States' controlled fusion program and doing intensive research in the design and operation of fusion reactors. He obtained his doctorate in the field of applied plasma physics and fusion technology and, in that same year, joined the technical staff of the Charles Stark Draper Laboratory. His work at Draper was geared strongly toward the design and integration of control systems for fusion reactor concepts and experimental devices, in both inertial and magnetic confinement fusion. In 1979, he developed a novel concept to guide and target fuel pellets in an inertial fusion reactor chamber. More recently he has been engaged in the design of a new concept in rocket propulsion based on magnetically confined high temperature plasmas. As a visiting scientist with the M.I.T. Plasma Fusion Center from October 1983 to December 1993, he led the plasma propulsion program there to develop this technology for future human missions to Mars. In December 1993, Dr. Chang-D�az was appointed Director of the Advanced Space Propulsion Laboratory at the Johnson Space Center where he continues his research on plasma rockets. He is an Adjunct Professor of Physics at the University of Houston and has presented numerous papers at technical conferences and in scientific journals. Selected by NASA in May 1980, Dr. Chang-D�az became an astronaut in August 1981. While undergoing astronaut training he was also involved in flight software checkout at the Shuttle Avionics Integration Laboratory (SAIL), and participated in the early Space Station design studies. In late 1982 he was designated as support crew for the first Spacelab mission and, in November 1983, served as on orbit capsule communicator (CAPCOM) during that flight. From October 1984 to August 1985 he was leader of the astronaut support team at the Kennedy Space Center. His duties included astronaut support during the processing of the various vehicles and payloads, as well as flight crew support during the final phases of the launch countdown. He has logged over 1,800 hours of flight time, including 1,500 hours in jet aircraft. Dr. Chang-D�az was instrumental in implementing closer ties between the astronaut corps and the scientific community. In January 1987, he started the Astronaut Science Colloquium Program and later helped form the Astronaut Science Support Group, which he directed until January 1989. A veteran of five space flights (STS 61-C in 1986, STS-34 in 1989, STS-46 in 1992, STS-60 in 1994, and STS-75 in 1996), Dr. Chang-D�az has logged over 1,033 hours in space. STS 61-C (January 12-18, 1986) which launched from the Kennedy Space Center, Florida, on the Space Shuttle Columbia. STS 61-C was a 6-day flight during which Dr. Chang-D�az participated in the deployment of the SATCOM KU satellite, conducted experiments in astrophysics, and operated the materials processing laboratory MSL-2. Following 96 orbits of the Earth, Columbia and her crew made a successful night landing at Edwards Air Force Base, California. Mission duration was 146 hours, 3 minutes, 51 seconds. Family: Astronaut. Country: Costa Rica, USA. Spacecraft: ISS, Mir. Flights: STS-61-C, STS-34, STS-46, STS-60, STS-75, STS-91, STS-111, STS-111 ISS EO-5. Projects: STS. Bibliography: 12, 5251. 1950 April 5 - . Birth of Dr Franklin Ramon Chang-Diaz - . Nation: Costa Rica, USA. Related Persons: Chang-Diaz. American physicist mission specialist astronaut 1980-2005. Shared record of seven spaceflights. 7 spaceflights, 66.8 days in space. Flew to orbit on STS-61C (1986), STS-34, STS-46, STS-60, STS-75, STS-91, STS-111..
2002 May 24 - . ISS Status Report: ISS 02-25 - . Nation: USA. Related Persons: Bursch, Chang-Diaz, Cockrell, Korzun, Lockhart, Onufrienko, Perrin, Walz, Whitson. Program: ISS. Flight: STS-108 ISS EO-4. 2002 June 5 - . 21:22 GMT - . Launch Site: Cape Canaveral. Launch Complex: Cape Canaveral LC39A. Launch Platform: MLP1. LV Family: Shuttle. Launch Vehicle: Space Shuttle. STS-111 - . Call Sign: Endeavour. Crew: Chang-Diaz, Cockrell, Korzun, Lockhart, Perrin, Treshchev, Whitson. Payload: Endeavour F18 / Leonardo. Mass: 105,000 kg (231,000 lb). Nation: USA. Related Persons: Chang-Diaz, Cockrell, Korzun, Lockhart, Perrin, Treshchev, Whitson. Agency: NASA. Manufacturer: Boeing. Program: ISS. Class: Manned. Type: Manned spaceplane. Flight: STS-111, STS-111 ISS EO-5. Spacecraft Bus: Shuttle. Spacecraft: Endeavour . Duration: 13.86 days. Decay Date: 2002-06-19 . USAF Sat Cat: 27440 . COSPAR: 2002-028A. Apogee: 387 km (240 mi). Perigee: 349 km (216 mi). Inclination: 51.60 deg. Period: 91.90 min. Bay 4: Mobile Base System (MBS) - 1600 kg. The Mobile Base System was made by MD Robotics of Brampton, Ontario. It was to be attached to the Mobile Transporter and used to mount the SSRMS Canadarm-2 arm and heavy payloads. Bay 6P: Adapter Beam / Wrist Roll Joint - 150 kg. The WRJ (Wrist Roll Joint) would be swapped with the broken one on the SSRMS arm. Bay 7-12: MPLM FM1 "Leonardo" - 10557 kg. The Leonardo module carried 8 Resupply Stowage Racks and 4 Resupply Stowage Plaftorms, with equipment to be transferred to the station. It also carried two science racks: the MSG (Microgravity Science Glovebox) and Express-3, which would be installed on Destiny. Leonardo, built by Alenia Spazio in Torino, also flew on STS-102 and STS-105. Bay 13P: ICAPC Beam / PGDF - 75 kg. The PGDF (Power-Data Grapple Fixture) would be installed on the P6 truss. Bay 13S: Adapter Beam / SMDP - 200 kg. The Service Module Debris Panels (SMDP) package contained 6 panels which would be stowed on PMA-1 until a later spacewalk attached them to the Zvezda module to protect it from space debris hits. 2002 June 9 - . 15:27 GMT - . EVA STS-111-1 - . Crew: Chang-Diaz, Perrin. EVA Duration: 0.31 days. Nation: USA. Related Persons: Chang-Diaz, Perrin. Program: ISS. Flight: STS-111. The spacewalk was made from the Quest airlock, which was depressurized at around 1522 UTC and the hatch was opened at 1524 UTC. The suits went to battery power at 1527 UTC. The astronauts installed the PGDF grapple fixture on the P6 truss, stowed some space debris shields on the PMA-1 adapter, and prepared the Mobile Base System (MBS) in the Shuttle cargo bay. The hatch was closed at 2234 UTC and the airlock began repressurization at 2242 UTC. 2002 June 11 - . 15:27 GMT - . EVA STS-111-2 - . Crew: Chang-Diaz, Perrin. EVA Duration: 0.21 days. Nation: USA. Related Persons: Chang-Diaz, Perrin. Program: ISS. Flight: STS-111. The MBS had been unberthed sometime around 2220 UTC and docked to the Mobile Transporter at 1304 UTC on June 10. 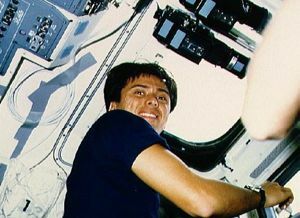 On June 11 at about 1515 UTC the Quest was depressurized again, with Chang-Diaz and Perrin opening the hatch around the same time and going to battery power at 1520 UTC. During this spacewalk the astronauts completed setting up the MBS system. The hatch was closed at 2016 UTC and Quest was repressurized at 2020 UTC. 2002 June 13 - . 15:16 GMT - . EVA STS-111-3 - . Crew: Chang-Diaz, Perrin. EVA Duration: 0.31 days. Nation: USA. Related Persons: Chang-Diaz, Perrin. Program: ISS. Flight: STS-111. The EVA was from the Quest airlock. Depress was at 1512 UTC with hatch open probably at 1514 and battery power at 1516. The astronauts replaced the wrist roll joint on the station's Canadarm-2 SSRMS robot arm; the old joint was stowed in Endeavour's cargo bay for return to Earth. The hatch was closed at 2229 UTC and the airlock was repressurized at 2233 UTC. At around 1918 UTC on June 14 the Shuttle RMS unberthed the Leonardo logistics module from Unity and put it back in the cargo bay, berthing it at 2011 UTC. 2002 June 15 - . STS-111 Mission Status Report #21 - . Nation: USA. Related Persons: Bursch, Chang-Diaz, Cockrell, Korzun, Lockhart, Onufrienko, Perrin, Walz, Whitson. Program: ISS. Flight: STS-108 ISS EO-4, STS-111, STS-111 ISS EO-5. 2002 June 16 - . 2002 June 17 - . 2002 June 18 - . 2002 June 19 - . Landing of STS-111 - . Return Crew: Bursch, Chang-Diaz, Cockrell, Lockhart, Onufrienko, Perrin, Walz. Nation: USA. Related Persons: Bursch, Chang-Diaz, Cockrell, Lockhart, Onufrienko, Perrin, Walz. Program: ISS. Flight: STS-108 ISS EO-4, STS-111. The hatches between Shuttle and Station were closed at 1223 UTC, with the Expedition 4 crew on the Shuttle for the trip home. Expedition 5 crew members Valeriy Korzun, Peggy Whitson and Sergei Treshchev remain aboard the Station. Endeavour undocked at 1432 UTC, leaving the Station in a 389 x 399 km x 51.6 deg orbit following three reboost burns. After two days of bad weather, Endeavour was diverted to Edwards AFB in California, with a deorbit burn at 1650 UTC on Jun 19 lowering its orbit from 347 x 387 km to 34 x 386 km. The Shuttle nominally entered the atmosphere around 1726 UTC and landed on Runway 22 at Edwards at 17:57:41 UTC. STS-111 Mission Status Report #29 - . Nation: USA. Related Persons: Bursch, Chang-Diaz, Cockrell, Korzun, Lockhart, Onufrienko, Perrin, Walz, Whitson. Program: ISS. Flight: STS-111 ISS EO-5.